Following the introduction of Islam in 1153, the islands later became a Portuguese ( 1558), Dutch ( 1654), and British ( 1887) colonial possession. In 1965, Maldives obtained independence from Britain (originally under the name "Maldive Islands"), and in 1968 the Sultanate was replaced by a Republic. However, in 38 years, the Maldives have had only two Presidents, though political restrictions have loosened somewhat recently. Western interest in the archaeological remains of early cultures on Maldives began with the work of H.C.P. Bell, a British commissioner of the Ceylon Civil Service. Bell was shipwrecked on the islands in 1879, and returned several times to investigate ancient Buddhist ruins. But by the fourth century AD, Theravada Buddhism came from Ceylon (present-day Sri Lanka) and became the dominant religion of the people of Maldives. Some scholars believe that the name "Maldives" derives from the Sanskrit maladvipa, meaning "garland of islands".Also "Mal" is fish "deeb" is land is also a favored suggestion by many islanders. In the mid- 1980s, the Maldivian government allowed the noted explorer and expert on early marine navigation, Thor Heyerdahl, to excavate ancient sites. Heyerdahl studied the ancient mounds, called hawitta ( Dhivehi: ހަވިއްތަ) by the Maldivians, found on many of the atolls. Some of his archaeological discoveries of stone figures and carvings from pre-Islamic civilizations are today exhibited in a side room of the small National Museum in Male'. Heyerdahl's research indicates that as early as 2000 BC, Maldives lay on the maritime trading routes of early Egyptian, Mesopotamian, and Indus Valley civilizations. Heyerdahl believes that early sun-worshipping seafarers, called the Redin, first settled on the islands. This was evident then in many mosques facing the sun and not Mecca, lending credence to this theory. Because building space and materials were scarce, successive cultures constructed their places of worship on the foundations of previous buildings. Heyerdahl thus surmises that these sun-facing mosques were built on the ancient foundations of the Redin culture temples. Heyerdahl's early mosques have now in large part been converted to face Mecca, as Islam gained solidarity in Maldives, in the earlier half of the modern Republic. According to Maldivian legend, a Sinhalese prince named Koimala was stranded with his bride — daughter of the king of Sri Lanka — in a Maldivian lagoon and stayed on to rule as the first sultan from the House of Theemuge. Prior to that Malé had belonged to a group of people today known as the Giravaaru who claim ancestry from ancient Tamils (Tamilas). The Maldivians followed Buddhism before they converted to Islam and the conversion is explained in a controversial mythological story about the demon Rannamaari. Over the centuries, the islands have been visited and their development influenced by sailors from countries on the Arabian Sea and the Indian Ocean littorals. Mappila pirates from the Malabar Coast — present-day Kerala state in India — harassed the islands. Although governed as an independent Islamic sultanate for most of its history from 1153 to 1968, Maldives was a British protectorate from 1887 until July 25, 1965. In 1953, there was a brief, abortive attempt to form a republic, but the sultanate was re-imposed. In 1959, objecting to Nasir's changes, the inhabitants of the three southernmost atolls protested against the government. They formed the United Suvadive Republic and elected a president, Abdulla Afeef Didi. After independence from Britain in 1965, the sultanate continued to operate for another three years. On November 11, 1968, it was abolished and replaced by a republic, and the country assumed its present name. Tourism and fishing are now being developed on the archipelago. In November 1988, Tamil mercenaries from Sri Lanka invaded the Maldives. After an appeal by the Maldivian government for help, India launched a military campaign to throw the mercenaries out of Maldives. On the night of November 3, 1988, the Indian Air Force airlifted a parachute battalion group from Agra and flew them non-stop over 2,000 kilometres (1,240 mi) to Maldives. The Indian paratroopers landed at Hulule and secured the airfield and restored the Government rule at Malé within hours. The brief, bloodless operation, labelled Operation Cactus, also involved the Indian Navy. On 26 December 2004 the Maldives were devastated by a tsunami following the 2004 Indian Ocean earthquake. The absence of land mass against which waves could be built up reduced the destructive impact, preventing the waves from reaching much more than 1.2 - 1.5 meters (4–5 ft) in height . Despite this, the archipelago's low lying nature (one of the lowest lying countries on Earth) meant that nearly all of the country was swamped. At least seventy-five people perished, including six foreigners. Current GDP per capita of Maldives registered a peak growth of 26.5% in the 1980s and stabilised around 11.5% in the 1990s. Tourism and Fisheries form the two key components of Maldivian economy. The country's shipping, banking and manufacturing sectors are also growing at a considerable pace. Among the South Asian nations, Maldives has the second highest per-capita GDP at 3,900 USD (2002 figure). Major trading partners include India, Sri Lanka, Thailand, Malaysia and Indonesia. The Maldivian economy was entirely dependent on fishing and other marine products for many centuries. Fishing remains the main occupation of the people and the government gives special priority to the development of the fisheries sector. The mechanization of the traditional fishing boat called " Dhoni" in 1974 was a major milestone in the development of the fisheries industry and the country's economy in general. A fish canning plant was installed in the island of Felivaru in 1977, as a joint venture with a Japanese firm. In 1979, a Fisheries Advisory Board was set up with the mandate of advising the government on policy guidelines for the overall development of the fisheries sector. Manpower development programs were begun in the early 1980s, and fisheries education was incorporated into the school curriculum. Fish aggregating devices and navigational aids were located at various strategic points. Moreover, the opening up of the Exclusive Economic Zone (EEZ) of Maldives for fisheries has further enhanced the growth of the fisheries sector. Today, fisheries contribute over fifteen percent of the GDP and engage about thirty percent of the country's work force. It is also the second-largest foreign exchange earner after tourism. The development of tourism has fostered the overall growth of the country's economy. It has created direct and indirect employment and income generation opportunities in other related industries. Today, tourism is the country's biggest foreign exchange earner, contributing to twenty percent of the GDP. With eighty-six tourist resorts in operation, the year 2000 recorded 467,154 tourist arrivals. The development of the tourism sector gave a major boost to the country's fledging traditional cottage industries such as mat weaving, lacquer work, handicraft, and coir rope making. New industries that have since emerged include printing, production of PVC pipes, brick making, marine engine repairs, bottling of aerated water, and garment production. Politics in the Maldives takes place in the framework of a presidential republic, whereby the President is the head of government. The President heads the executive branch and appoints the cabinet. The President is nominated to a five-year term by a secret ballot of the Majlis (parliament), a nomination which must be confirmed by national referendum. The unicameral Majlis of the Maldives is composed of fifty members serving five-year terms. Two male members from each atoll are elected directly by universal suffrage. Eight are appointed by the president. The Maldivian Peoples Party has seized exclusive control over the government; however, opposition parties were legalized in 2005 after the elections. The opposition party Maldivian Democratic Party has tried hard to achieve its goals in amending the existing constitution, which in all major aspects has failed due to the government pressure and hesitations to stop the process. The current Home Minister is Ahmed Thasmeen Ali. Ustaz Mohamed Rasheed Ibrahim from Fuvahmulah is the present chief justice of Maldives. All judges in the Maldives are appointed by the president. Islamic law is the basis of all judicial decisions. The Maldives have, in cooperation with the United Nations Development Project (UNDP), undertaken to write the first Muslim criminal code in the history of the world. This project would formalize the proceedings of criminal justice in this tiny nation to one of the most comprehensive modern criminal codes in the world. The code has been written and awaits action by the parliament. Since 1996, Maldives has been the official progress monitor of the Indian Ocean Commission. In 2002, Maldives applied for full membership, but was refused. The first reason they were rejected is that their geographical position is different from other member states. Maldives are considered in Asia instead of Africa. The other reason was more complicated. The official language spoken by the Commission was French with Creole used in friendly conversations. Maldives speak English and a language totally unrelated to the other members. It was proposed to change the language to English, which the people of Reunion, Comoros and Mayotte do not speak, and so the idea was dropped. The third reason was due to the difference in historic background. However, Maldives were given a more important role and semi-membership. Maldives has twenty-six natural atolls which have been divided into twenty administrative atolls and one city. The northern most atoll is Haa Alif Atoll and the southern most is Seenu Atoll. The smallest atoll is Gnaviyani Atoll with only one island ( the largest island in Maldives). The largest atoll in both Maldives and the whole world is Gaafu Alif Atoll which is just south of the One and a Half Degree Channel. Each atoll is administered by an Atoll Chief (Atholhu Veriyaa) appointed by the President (Maumoon Abdul Gayoom). Atoll chiefs administer as directed by the president. The Ministry of Atoll Administration and its Northern and Southern Regional Offices, Atoll Offices and Island Offices are collectively responsible to the President for Atolls Administration. The administrative head of each island is the Island Chief (Katheeb), appointed by the President. The Island Chief's immediate superior is the Atoll Chief. Maldives holds the record for being the flattest country in the world, with a maximum natural ground level of only 2.3 m (7½ ft), though in areas where construction exists this has been increased to several metres. Over the last century, sea levels have risen about twenty centimeters (8 in). The ocean is likely to continue rising and this threatens the existence of Maldives. 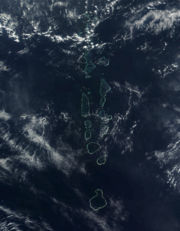 A tsunami in the Indian Ocean caused by the 2004 Indian Ocean earthquake caused parts of Maldives to be covered by sea water and left many people homeless. After the disaster, cartographers are planning to redraw the maps of the islands due to alterations by the tsunami. The people and government are worried that Maldives could be wiped from the map eventually. The Maldivian ethnic identity is a blend of the cultures reflecting the peoples who settled on the islands, reinforced by religion and language. The earliest settlers were probably from Southern India. Indo-Aryan speakers followed them from Sri Lanka in the fourth and fifth centuries. In the 12th century, sailors from the Malayan Archipelago, East Africa and Arab countries inhabited the islands, creating the present heterogeneous blend of ethnicity amongst Maldivians. Originally Buddhist , Maldivians were converted to Sunni Islam in the mid-12th century. Islam is the official religion of the entire population, as adherence to it is required for citizenship. The official and common language is Dhivehi, an Indo-European language related to Sinhalese, the language of Sri Lanka. The written script is called Thaana and is written from right to left. English is used widely in commerce and increasingly as the medium of instruction in government schools. Some social stratification along lines similar to the Indian caste system exists on the islands. It is not rigid, since rank is based on varied factors, including occupation, wealth, Islamic virtue, and family ties. 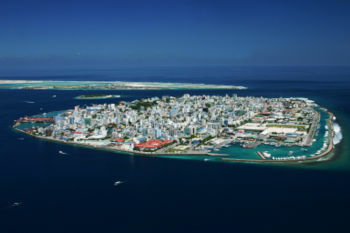 Members of the social elite are concentrated in Malé. Outside of the service industry, this is the only location where the foreign and domestic populations are likely to interact. The tourist resorts are not on islands where the natives live, and casual contacts between the two groups are discouraged.